White-nose syndrome is a disease affecting hibernating bats. It is named for the white fungal growth on the nose and wings of infected bats. First identified in a cave in Schoharie County, New York, USA, in February 2006, it has since spread to a number of other caves in the North Eastern United States and Eastern Canada, killing in excess six million bats. As announced on May 18th, 2018, White-nose syndrome has been confirmed on bats in Manitoba. If you happen to discover any bats exhibiting unusual behaviour (flying outside in winter), bats that appear diseased, and any dead or dying bats please report them immediately to the Speleological Society of Manitoba at 1-866-981-CAVE, or to The Manitoba Bat Blitz at 204-258-2909 or by email to [email protected]. 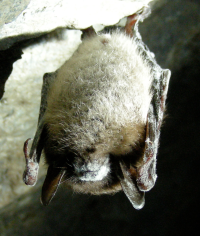 Although bats in Manitoba have yet to be infected, the Speleological Society of Manitoba has developed the following precautions to minimize the risk of transmission while caving in Manitoba. Caves that are known to be bat hibernacula will only be visited when there is a specific goal to achieve (i.e. not for recreational purposes). Once a hibernaculum is entered, no other caves will be entered until such a time that all equipment and clothes are properly disinfected following U.S. Fish and Wildlife Service decontamination protocols. Additionally, the SSM follows Manitoba's Bat Hibernacula Management Guidelines and does not enter bat caves between September 15th and May 1st.